Welcome! If you are coming from Cedar Hill Farmhouse, I’m so glad you’re here! Today, I’m joining some of the most talented bloggers I know for the Styled + Set Holiday Entertaining Blog Tour hosted by Lory from Designthusiasm. Be sure and find links for all of the other bloggers at the bottom of my post. Valentine’s Day is traditionally reserved for a party of two. Each year, restaurants all over the country rearrange their seating on February 14th to add the plethora of two-tops which are in such high demand. Menus become limited. Prices are hiked. Essentially you pay more for less. Moreover, there tend to be very few large parties. Let’s try to change all of this, shall we? Don’t worry ladies, I am not trying to remove the romance from Valentine’s Day. I would never do that! I love that aspect of this holiday. 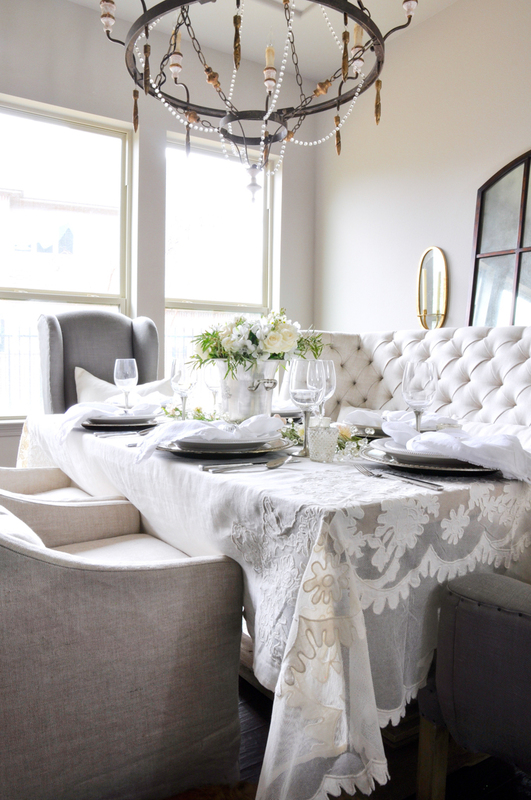 But, how fun would it be to get together with a few other couples and host a fabulous dinner party on this special day? 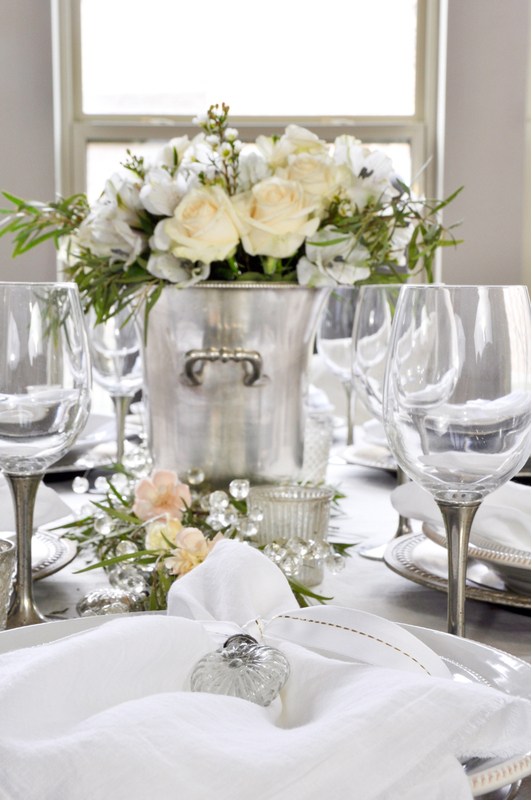 Let’s face it: dining out on popular “dining out” occasions is not always smooth. The restaurants are packed and they often can deny the very intimacy you are seeking. And if you are going to deal with a crowd, why not pick the crowd and entertain them in your own home? This will be a fun and entertaining evening and you get to control the menu, music, lighting, etc. This is a win-win! I created a tablescape fitting for a Valentine’s dinner party. 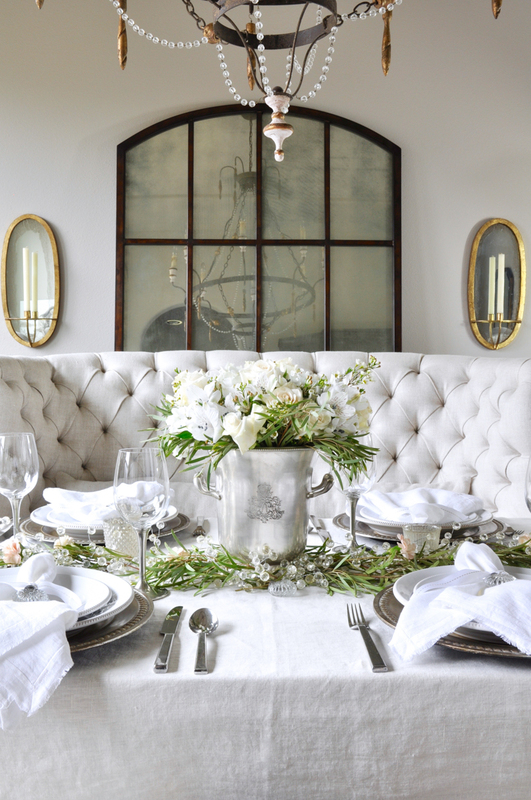 But remember, when you don’t go overboard with your theme, the same look can be used for other occasions such as a shower, a brunch or Mother’s Day. 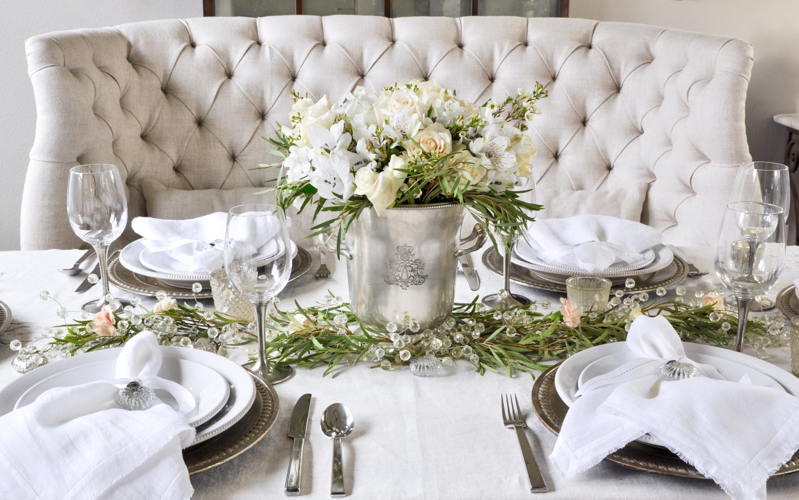 A neutral color palate for the floral arrangement softens the tablescape. I kept my Valentine’s table neutral last year as well. You can find it here. 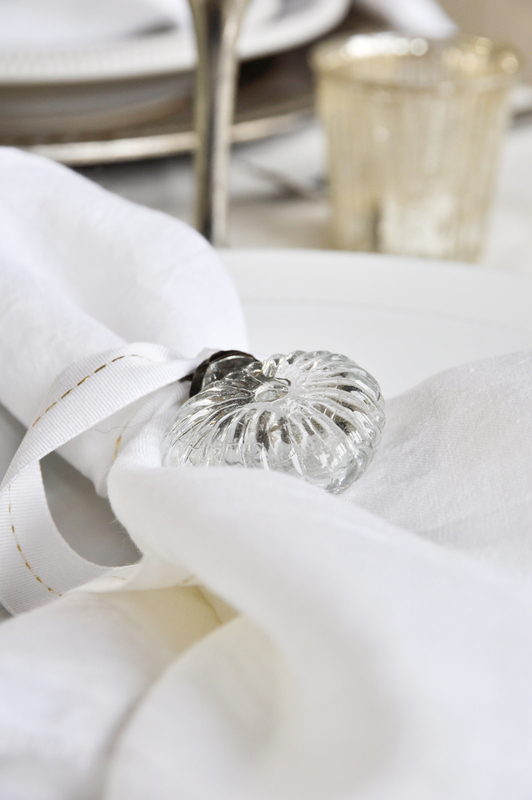 Subtle details such as this heart shaped accent piece add that little extra something to the table. 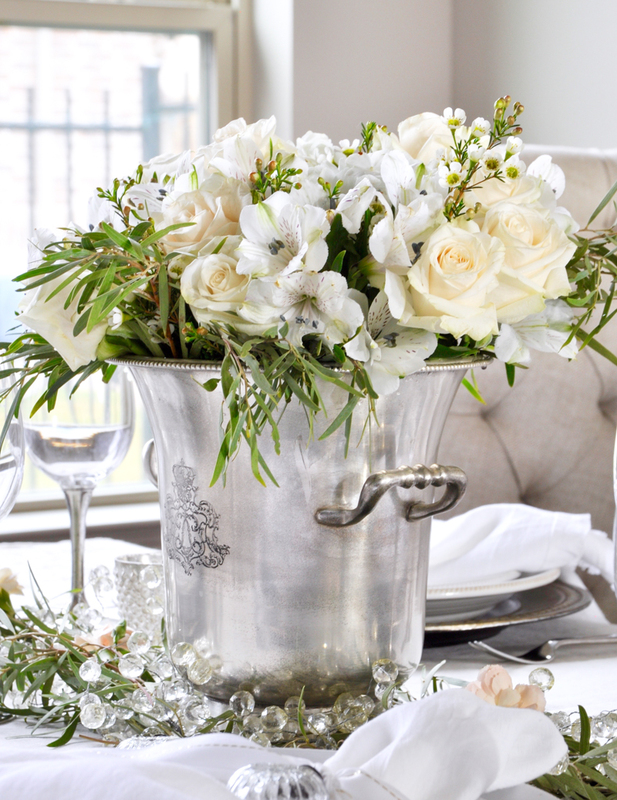 A champagne bucket doubles as a floral vase. 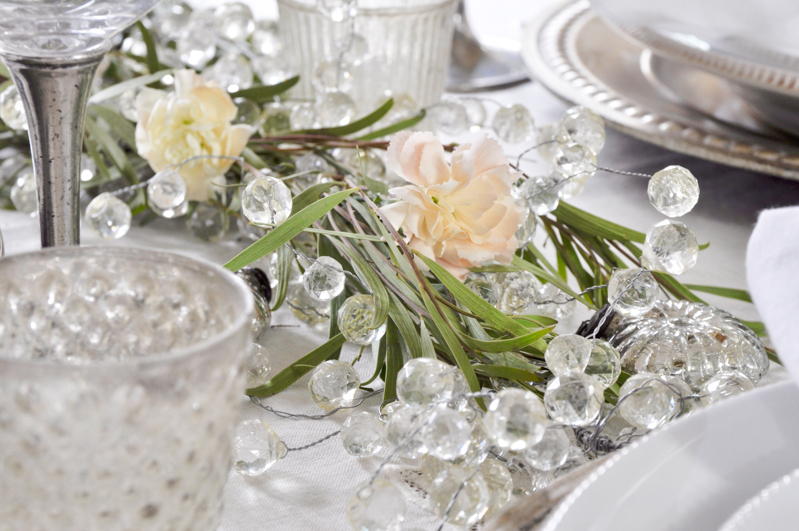 You can lay some greenery and flowers around the table to keep the mood romantic in a group setting. If you are looking for a way to change things up a bit this Valentine’s Day, consider hosting a group dinner with some select friends. I think you will be glad you did and enjoy the change of pace this setting will provide. If you have any other ideas on how to make this group date a bit more special please share them in the comments below. For additional sources, please click here. Be sure and visit all of the bloggers on the tour for more Valentine’s entertaining inspiration! Next stop, Life on Virginia Street. Jen!! You totally outdid yourself! So gorgeous, so romantic. That centerpiece is nuts!! You are so sweet Kelley! Thank you! Jen wow wow wow! That arrangement is so stunning!! Ok I really need some lessons because I cannot pull that off on my own! Gorgeous! So kind of you Bree! A fun little secret is…..I had pink flowers and intended to use them, including pink lilies which remind me of you, but I got the white in place and it just seemed right. I adore your colorful tablescapes, so please keep them coming! Jen, what an absolutely gorgeous table!! 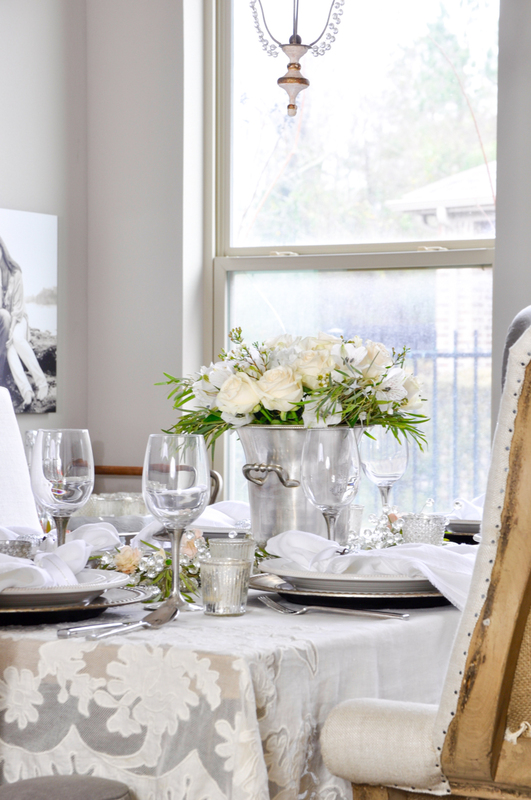 I love how your settee sets the tone as an elegant backdrop for the stunning pieces that are featured on the table. 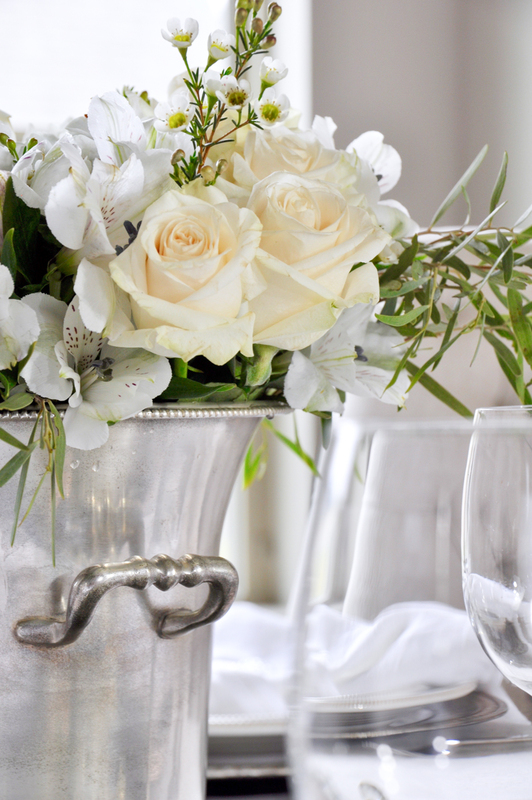 I’m particularly in love with the wine bucket centerpiece with floral that’s just beautiful! Funny thing – I wrote almost exactly the same thing in my introductory post – I guess we’ve all experienced that Valentine’s dining out experience that’s not exactly perfect… 😉 Loved this post! Hi Lory! First, thank you so much for hosting this fun tour. I especially love holiday entertaining posts and you’ve gathered such a wonderful group of bloggers to share them! I’m grateful to be included. Can’t wait to see your take on the Valentine’s night out vs. staying home! Thanks again for hosting and for your kind words! Stunning Jennifer! 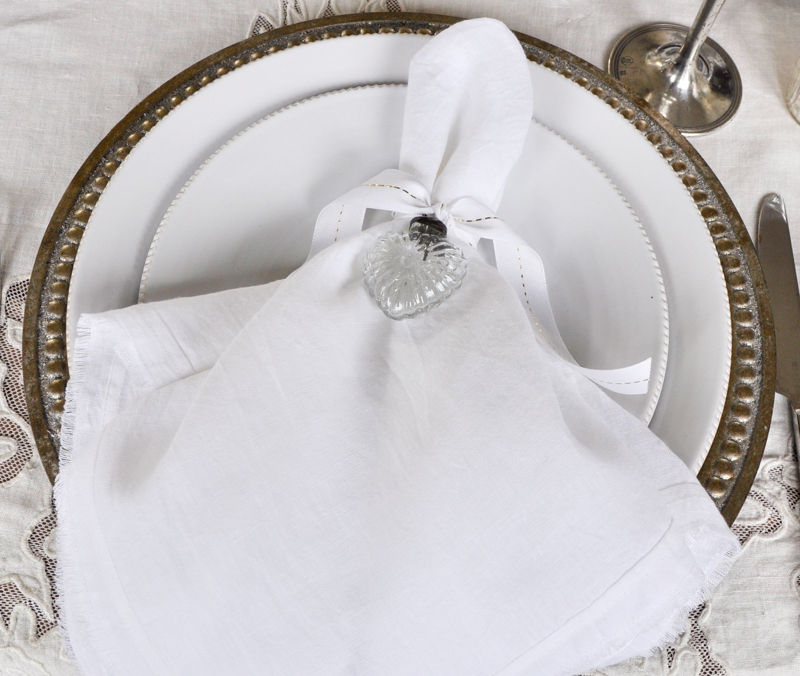 I love the champagne bucket as vase and the subtle heart touch on the napkin rings. 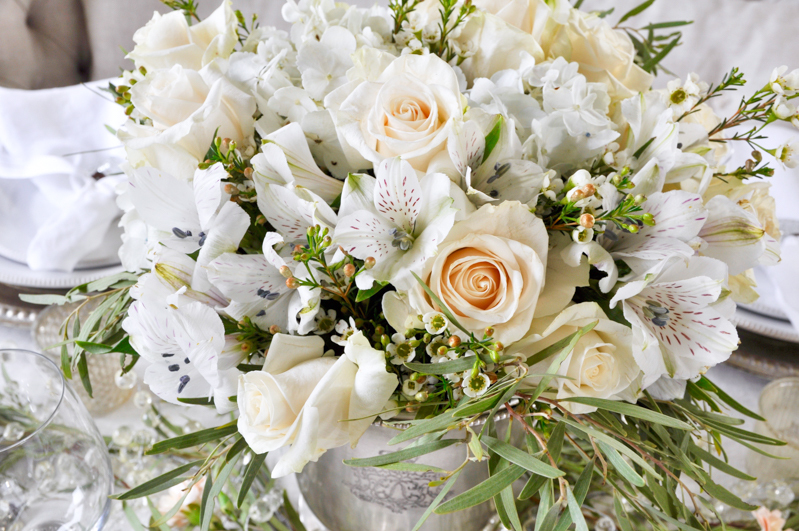 The flowers remind me of my wedding bouquet – love !! So lovely to tour with you again. Thank you so much Kelly! Wonderful to tour with you again too! You can never go wrong with white! Love the champagne bucket that serves as a vase! So classic. Your table is really lovely! I love your idea of having couples over for dinner. A few years ago now, friends of ours we met through scouting had about 10 couples over for a wine and dinner pairing. They told us what to cook and which old world wine to bring ~ the dinner was fabulous! Each party was asked to bring their dish, two bottles of their wine, and three glasses per person to taste every wine. It was a great success! Thank you so much Barbara! I love that idea…thanks for sharing!! !